FRONTLINE SPORT & LEISURE LTD. 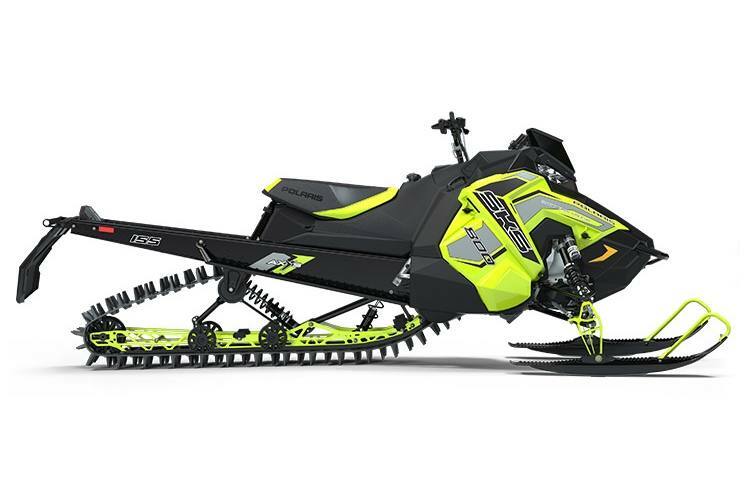 The 800 SKS 155 is the most versatile deep snow crossover sled. 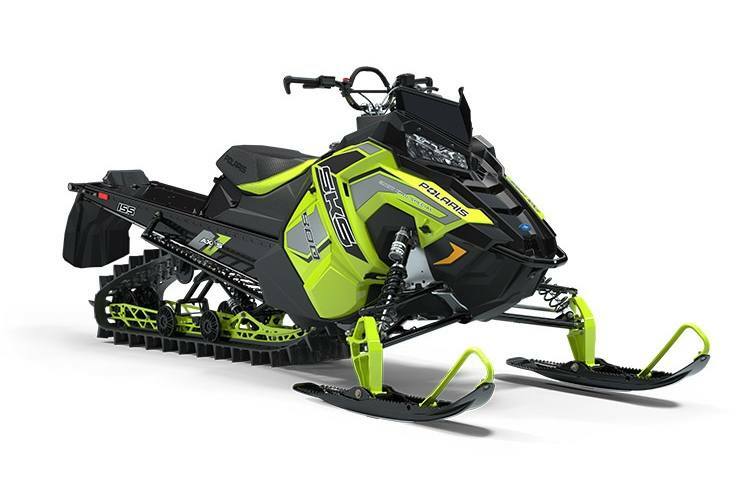 This sled features the legendary RMK Rider Balance and agility, and with its bogey wheels and bulkhead cooler, it maintains proper engine temperature for mixed use riding in all snow conditions. It is perfect for riders that use the trails to get to deep snow. Customize your sled with exclusive color combinations during SnowCheck 2019. Patented Raised AXYS® RMK® Chassis: The lightweight, rigid rear suspension design features revised geometry to control pitch. This improves weight transfer, delivering better control and a more compliant ride. The rigid suspension delivers power directly to the snow. Off-trail, riders will notice improved weight transfer while maintaining the approach angle. On-Trail, riders will notice a more compliant and comfortable ride. The rear suspension features a rail design that helps lift the rear skid while driving it forward. Walker Evans® Piggyback Clicker Shocks: The Walker Evans® Piggyback Clicker Shocks with compression adjusters and remote reservoirs offers the best performance across the broadest range of conditions. Legendary RMK Balance: The patented AXYS® chassis delivers the RMK's renowned perfect balance that riders have come to expect. The AXYS RMK offers increased, ultimate control and a more compliant ride. Narrow, Adjustable Front End: Narrow 39"-41" adjustable front end; Ideal for setting up for more stability or ultimate performance while tree-riding and boondocking. Lightweight: Polaris snowmobiles are the lightest sleds on the mountain. Polaris®mountain sleds have always been light AND rigid, and Polaris has added strength & durability while reducing weight on the RMK® AXYS® platform. Polaris uses design optimization software to analyze the loads and stress points for various systems and components of the snowmobile which allows the team to design lightweight yet durable snowmobiles. Providing riders with instantaneous lift, Polaris sleds help riders get up on top of the snow faster due to the lighter weight, increase in power from the 800 H.O. Cleanfire® Engine, Polaris-exclusive track designs and the raised chassis. Forged Aluminum A-Arms: The one-piece, forged a-arms are lighter (approximately 1.5 lbs lighter) while providing optimal strength. Forging is widely used and proven through the automotive industry. This design reduces unsprung mass leading to a better ride quality and increased maneuvarability. LED Lights: All models built on the AXYS® platform feature standard LED headlights. LED headlights deliver the industry's best lighting: Nearly 1 lb. lighter and high beams are 80% brighter than incandescent lighting; Color temperature or output of the lights (the “whiteness" of light, reported in Kelvin) is 5000K, closely matching daylight; LED headlights last the entire lifetime of the sled. A major durability enhancement over traditional incandescent headlights which experience filament burn out; For constant visibility and enhanced safety, the low beams remain on at all times. Even when the high beam is activated, there is never a period of no light. Additional SKS Cooling: The SKS features standard bogey wheels and a bulkhead cooler to better maintain proper engine temperature for mixed use riding in all snow conditions. Brakes: Lightweight RMK brakes feature a fixed 2 piston opposed caliper design for an improved and quicker braking response and feel. The brake pad material features higher thermal properties to provide more optimal wear over time. Polaris Interactive Digital Display: Exclusively from Polaris - the most advanced instrumentation in snowmobiling. This 4.3" high resolution, full color, LCD digital display provides a rider with information including: Sled performance: Speedometer, tachometer, dual tripmeters, average speed, max speed, engine/trip hours & odometer Sled operating conditions: Coolant temperature, diagnostics & maintenance warnings; Riding conditions: Air temperature, time of day in 12 or 24-hour clock format; Bluetooth™ functionality: Enables the gauge to communicate with the rider's cell phone and provide notification of incoming calls or texts. Displays phone battery & signal strength; GPS/Mapping Capability: A compass is standard, & full-featured GPS can be installed to provide directions & information about services such as fuel, restaurants, lodging & Polaris dealerships. Customize the GPS to operate with North Up or Course Up navigation depending on your preference; Ride Planning Feature enables you to plan a ride using Ride Command, save it as a GPX file, and transfer it to the display through the USB interface; This gauge comes as an option on some models, and is available as an accessory option. Integrated Storage Solutions: Optional, accessory storage was designed and developed right along with the AXYS RMK® platform, so it installs securely and features seamless, integrated styling that matches the sled's design lines. Polaris Engineered with the highest quality of materials. Professional rider on a closed course. Polaris recommends that all snowmobile riders take a training course. Do not attempt maneuvers beyond your capability. Always wear a helmet and other safety apparel. Never drink and ride. Customize your sled during SnowCheck 2019, March 6-April 17, 2018. Color customized sleds will be available in season but availability will vary by dealership.